Earlier today, the OC Register published an article about Democratic prospects in the upcoming elections for County Supervisor. A portion of the article examines the record of our Supervisor, Michelle Steel (R). 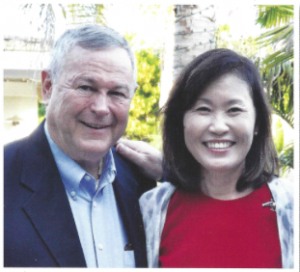 In the article, Supervisor Steel provides three of her accomplishments which she thinks are notable; she also highlights the two goals that she hopes to achieve if re-elected this year. In the article, the Register provides the shockingly few number of agenda items that Supervisor Steel has proposed during her term in office. Read the full article here, or read below for a annotated summary. Spoiler alert: Supervisor Steel has done virtually nothing to justify the millions of taxpayer dollars that have been paid to her and her staff. The lack of meaningful action has been abysmal and embarrassing. We’ve all been duped! Paying attorneys to symbolically join a immigration lawsuit that is already being litigated. “Monitoring” a settlement agreement about airport noise that affects “some Newport Beach neighborhoods” (county attorneys will likely be the individuals who are tasked with ensuring compliance; also, the airport noise doesn’t affect the overwhelming majority of residents in the district). An action in which county supervisors increased their oversight of a commission tasked with reducing hate crimes — a commission Steel previously sought to defund. That’s it, folks. We’ve paid her, and her staff, millions of dollars, and this is all we’ve received in return. Perhaps even more troubling than her anemic track record is the complete and utter lack of vision going forward. There are many significant issues for our County Supervisor to address, but Mrs. Steel doesn’t seem up to the task. Whether Mrs. Steel is incapable of effectively handling this critical job, or whether she simply is not interested in working tirelessly for her constituents, one thing is abundantly clear: on June 5th, we need to vote for Brendon Perkins (D) for Supervisor!